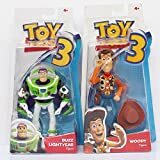 This advanced talking buzz lightyear action figure is an official Disney product and can be used to develop the cognitive skills of your child along with keeping your child entertained. 5.0 out of 5 starsBuzz Lightyear to the rescue! I ordered this toy for my 2 year old cousin brother, and as I had anticipated, this is an outstanding Buzz Lightyear Action Figure! Buzz has got all the visuals and the functions from that of the flick. For instance, laser light, space wings and talking phrases from the movies. The delivery was quick, took a week or so, due to the blizzard in the U.S.A. The packaging was great and the toy showed up without any flaws. This toy, for it's price, is magnificent. The best thing about this toy was the smooth articulation, the karate chop action, the phrases as well as the wrist communicator pop-up. It's not at all so heavy and is remarkably well built and sturdy enough to take damage from a two year old. Disney store has done an outstanding job in making this toy. 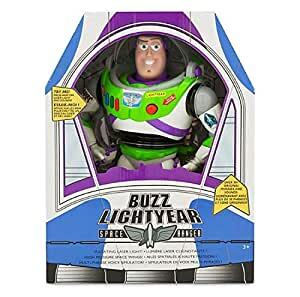 I surely recommend this toy to all of those who would like a great Buzz Lightyear action figure at a low price. It's a great toy. Excellent detailing. My 2 year old really liked it. The delivery was also done on time. 5.0 out of 5 starswe just love him! Again I must say it's just like in the movie and we are very happy that we bought it. Just a tiny problem with its balance... I guess the upper body is a little bit heavy and so it topples very easily. Great product. Value for money. Delivered before estimated date of delivery, so keep it up for your prompt service Amazon. Product quality is very good. My son is excited and enjoying his new toy very much. Nice product. Clearly as mentioned on the website. Color has come of from few places after one month use. My Kid is extremely happy with this product. He enjoys his life with "Buzz". 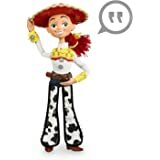 4.0 out of 5 starsideal toy for any Toy Story fan. 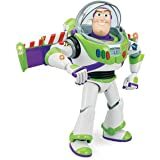 My son loved this talking buzz, ideal toy for any Toy Story fan.